As of June 2017 it is possible for teachers to bulk create blogs for their pupils. The blogs will be given the pupil’s glow username as a Site Name (the url). If a blog already exists with that username the teacher, or the pupil, needs to create a blog with a different site name manually in the usual way. Teacher will need to be an administrator of at least one blog to gain access to the creator. The pupils will need to be listed in SEEMIS and that data up to date in Glow. Here are the steps that a teacher needs to follow to create a set of class blogs or e-portfolios. Visit the dashboard of a site that you are an administrator of. 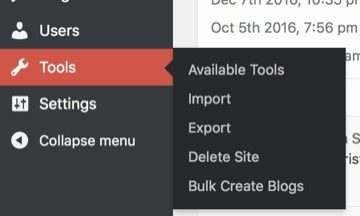 Choose Bulk Create Blogs from the Tools menu of the dashboard sidebar. On the Bulk Create Blogs page, you select LA, then school and then curricular or year group. This will produce a list of pupils. You can alter the selection to filter the pupils you want to create blogs for. Select either blogs or e-Portfolios. Selecting e-Portfolios will automatically activate the e-portfolio plugin. Then click Create sites for selected users. This will create sites for the selected users, displaying a message with the URL to the new blog. If a blog already exists with the site name, a message will be displayed. The new blogs will be set to private. The pupils will be the administrator. The teacher creating the sites will not have a role on the site. The pupils can find their new site in the My Sites page linked to from the LA blog home page. They should either make the blog Glow Only in settings->reading. More information on privacy settings. We would recommend this approach. Alternatively, pupils could keep their blog private, adding their teacher and any other potential visitors to their blog. See adding users setting roles for more information. We would recommend that teachers follow their pupils e-Portfolios once they have access to them. This will save a lot of work in keeping up with their pupils. Glow Blogs Reader.